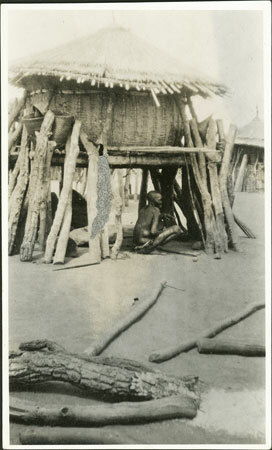 A woman sitting beneath a household granary or gbamu constructed using wickerwork for the base and with a movable thatched roof to access eleusine or other crops. It is raised from the floor on a platform to avoid pests, which also provides an everyday shaded area for social activities. Notes on print/mount - "+49 51/10 EPA759"
Notes on card mount m/s pencil - "RCS/SS upper & middle & fading? 8.89"
Morton, Chris. "Zande granary " Southern Sudan Project (in development). 03 Jan. 2006. Pitt Rivers Museum. <http://southernsudan.prm.ox.ac.uk/details/1998.341.759.2/>.